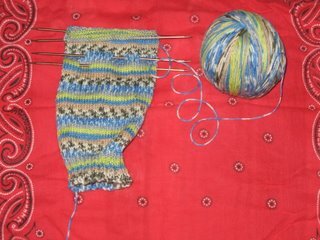 This is how I learned to knit socks, and even though I sometimes knit with sets of five DPNs, and know how to knit socks on two circulars and even one, this is the method I always return to. I like it. Partly because I am a purist and like to do old-fashioned things the old-fashioned way, and partly because this is just my automatic, default mode of knitting socks. Have you ever taken a moment to consider how critical a pair of socks might have been during the Revolutionary War? As non-knitters often remind us (just in case we hadn't noticed that giant Wal-Mart where a neighborhood park and school used to be), we can buy socks anywhere today, for next to nothing. But this was not the case during the Revolutionary War. If you dig around inside your brain and dust off the box labeled "American History," you will find a certain scrap of information handed out to every schoolkid, the bit about how cold it was during the Revolutionary War, and how many soldiers suffered from lack of proper shoes and warm stockings, often resorting to wrapping rags around their bloodied feet in order to keep pressing on against the British. One Mary Frazier of Pennsylvania made a personal mission out of providing warm clothing and hand-knit stockings for the troops at Valley Forge, frequently loading her horse's saddlebags with needed items. She would find her way to the various camps by following the marks of bloody footprints in the snow. Imagine. For the simple want of socks and shoes. So can you imagine how critical knitting was at the time? I have a guess as to why Americans usually knit on sets of four double-pointed needles, instead of five. And I imagine it started during Colonial times, when needles, like shoes and readymade stockings, were in short supply, due to various shortages and boycotts against British goods. I like to imagine a group of say, two dozen or so Colonial women, gathered in some farmhouse one cold winter afternoon, cranking out socks in a hurry for Washington's troops. Everyone in the village who owns a set of sock needles has gathered together in this place to share the work, enjoy each other's company, and perhaps hear a bit of news about the war. Those without needles help by winding yarn into balls, carding fleece, and spinning. Needles click and the knitters discuss which one is having a troublesome pregnancy and which one is casting her eyes at that handsome young farmer down the road. One complains that her hens won't lay. Another makes a pot of hot cider. Suddenly, one of the knitters recalls how she once "made do" when she had temporarily misplaced one of her sock needles. She had rearranged the stitches and worked on four needles. That stocking had turned out just fine. She pauses for a moment, and looks about the room, regarding each of the knitters busily wielding a set of five needles. She does a little calculation in her head and she proclaims, "there are twenty knitters in this room. If each of us knits with only four needles instead of five, we shall have twenty spare needles -- five more sets of needles with which to make stockings. Let me show you how it's done..."
Everyone considers this for a minute. One by one, they begin to rearrange the stitches on their needles, fiddle a bit with their arithmetic, and employ some bright thread scraps for stitch markers. Someone gathers up the surplus needles, and sets of four are handed out around the room. Soon there are twenty-five people knitting. By the end of the evening, there will be twenty-five more socks for Washington's troops, five more than would have been possible when the sun came up that morning. One of the women at this gathering happens to operate a drygoods store along with her husband. She returns to the shop the next day, divides her needles into sets of four, and sells the sets for a slightly smaller price than the drygoods shop down the street, giving herself a competitive edge. Word spreads. It becomes a local habit, this business of knitting with only four needles. Needle merchants pick up this bit of marketing savvy and pass it on to other colonial towns, where it catches on. And so, to this day, most Americans knit socks with four needles. Hey, it could have happened that way. I like to think that it did. I like to think that necessity encouraged some bright woman long ago to "unvent" something truly ingenious, at a time when something as simple as a pair of wool socks may well have saved the day to keep a Revolutionary soldier warm, functioning and focused on the enemy instead of his frostbitten toes. One woman's quick thinking may very well have provided 20% more socks to the Revolutionary Army. For all I know, more warm feet may have helped turn the tide of the war. While that story is pure speculation, the following story is true. There was a Pennsylvania woman named "Old Mom Rinker" whose village inn was invaded by the British, and whose family had the detestable duty of pouring ale and serving stew to the Redcoats. Because Old Mom Rinker was "only a woman," and a humble innkeeper at that, the British officers arrogantly assumed her to be stupid, unable to comprehend military strategy, and unworthy of consideration. So each night, as her family waited on the Brits, they kept the ale flowing and kept their ears open. Rinker devised her own way to convey what they learned about British troop movements to the Revolutionary army. Each morning, after breakfast was served, she would carry her kntting basket to a steep bluff overlooking the road, and would sit on a rock at the edge of the bluff and knit. Imagine how quaint she appeared ... how invisible she would have been to the British officers ... an old woman, sitting on a rock and knitting in the morning sun. What the British officers did not know was that Old Mom Rinker had written down everything she heard them say on a slip of paper. And she had folded that paper around a small stone, and used this little package as the core around which she wound her ball of yarn. They also did not know that she watched for a rider on the road below, and that when he appeared, she would oh-so-casually nudge the ball of yarn over the edge of the bluff, and let the ball drop down, unwinding as it went, to finally run out of yarn. The weight of the stone then carried the note to the ground, where it was secured by the rider, who would trot off into the forest with critical news for General Washington. Then, ever so casually, she would wind the yarn up again, and go on her way. Who knows how important those messages were to the outcome of the Revolutionary War? Every year, on the Fourth of July, I contemplate what I like and dislike about the America of today. I wonder what the founders of our nation would think about the way the nation they midwifed into existence has grown up. I also wonder how many other Americans stop for a moment on the Fourth of July, not to be jingoistic about the America of the present, but rather to reflect on the America of the past, and to ask ourselves if we are living up to the challenge set out for us 230 years ago. I like to think about where we came from. Whether or not the founders of this nation might have reconsidered a few things if they could see us today ... whether they would have handled some things differently ... what they would think of our mistakes ... and how pleased they would be on the things we've done well. I can see you scratching your head with that size four DPN. You're saying, "wait a minute, that's not an American Flag. That's a yellow flag with a snake on it." You are quite correct in the latter observation. It is indeed a flag with a snake on it. It is also the very first American flag. It is called the Gadsden Flag, named so for Colonel Christopher Gadsden who led the Sons of Liberty in South Carolina beginning in 1765 and who later served in in the Continental Army. In 1775, he represented South Carolina in the Continental Congress. "She never begins an attack, nor, when once engaged, ever surrenders. She is therefore an emblem of magnanimity and true courage. She never wounds until she has generously given notice, even to her enemy, and cautioned him against the danger of treading on her." Colonial folk held the superstitious belief that snakes, having been chopped up, could somehow re-assemble themselves and crawl away. Biologically impossible as this may be, the superstition had fantastic value as a cultural icon. In 1754, Ben Franklin designed, carved and published a woodcut of a rattlesnake cut up into thirteen sections, each section labeled with the name of a colony. The picture was entitled, "Join or Die." It was the first political cartoon published in an American newspaper. The rattlesnake symbol became immensely popular amongst the Revolutionaries. The image was picked up by Gadsden, who placed his version of it on the flag of the Sons of LIberty. 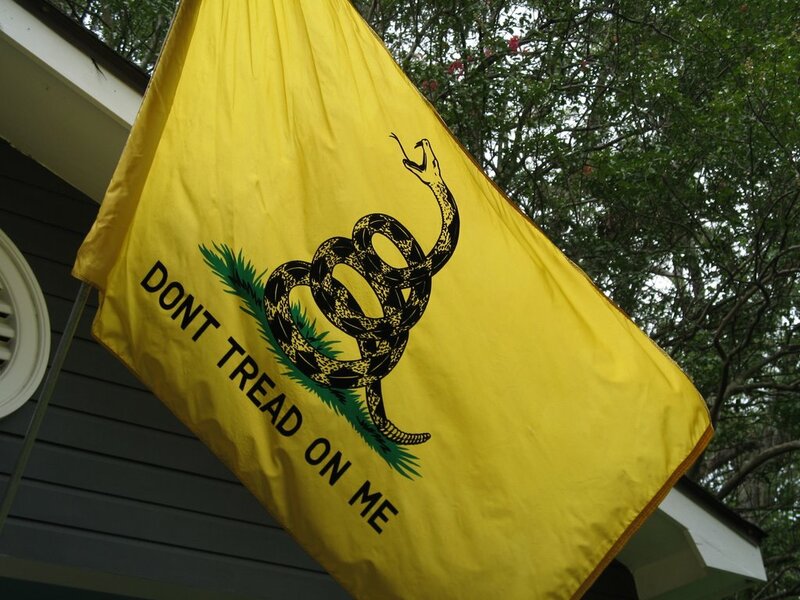 This flag (the flag on our house) depicts a intact rattlesnake, coiled in a state of vigilance, captioned with the warning: DONT TREAD ON ME. The Virginia Minutemen added the phrase, LIBERTY OR DEATH to their version of the Gadsden flag. A modified version of DONT TREAD ON ME depicts a rattlesnake crawling diagonally across a field of thirteen red and white stripes. This last was the first flag ever flown on an American military ship. To this day it is called the Navy Jack. The lack of an apostrophe in the "DONT" is not an accident. Standards for abbreviation were inconsistent at the time. We fly this flag at our house to remember that the nation founded 230 years ago was a nation founded by dissidents, by people who were unhappy with the status quo. It was not founded by British Loyalists. It was founded as a living nation, with a living Constitution. Living things grow and change. This nation was founded by men considered to be enlightened by many people of their time, and traitorous by others. They drafted and signed a Constitution knowing full well that they might be hung for treason. They also had their flaws -- they created a nation with "liberty for all," yet owned slaves and scoffed at the notion of women voting and participating in politics. And these flawed, yet forward-thinking people did something remarkable: they created a brand-new nation with the intent that this nation could, and would change. With the intent that those who disagree with it should -- make that must -- unite and change things when this nation goes wrong. Not only is it not unpatriotic for an American citizen to voice diagreement with government -- it is our solemn duty to do so. It is the very reason this nation was created, so that a static and tyrannical government would not maintain power over the people. I doubt very, very much that Thomas Jefferson or Benjamin Franklin would have taken to the notion, "My country, right or wrong." They would have wanted it to be right. And, if it wasn't, they would have changed it. When you think about it, it's a lot like knitting. You make something. If it doesn't fit, or it didn't work out the way you planned it, you have a choice: you can go ahead and wear it anyway, and endure the imperfection. I am sure there are knitters out there who proclaim, "my sweater, mistakes and all" -- and you have the right to do that -- or, you can rip it out and start over. Either way, you have every right to take pride in being a knitter. I loved the story of the flag. Delightful contemplation. I honor my Great-grandmother, Delilah Springsteen, who taught me to knit. She, born in 1868, said she learned to knit socks "for the war". Naievly, I thought she meant WW I. Nay, it was the Spanish American War, when she was a young woman. I often ponder on her life, one war after another, until her death in 1968 during the Vietnam War. Such is our history, such is our present. Sigh. Dez, I thoroughly enjoyed your "historical short story" - do we hear the sounds of a budding fiction writer? Keep on reminding our fellow Americans how important it is to correct the wrongs in our government - it's truly our civic duty, for if not us, who? Dez - loved your sock story, and as an Aussie will refrain from political comment. 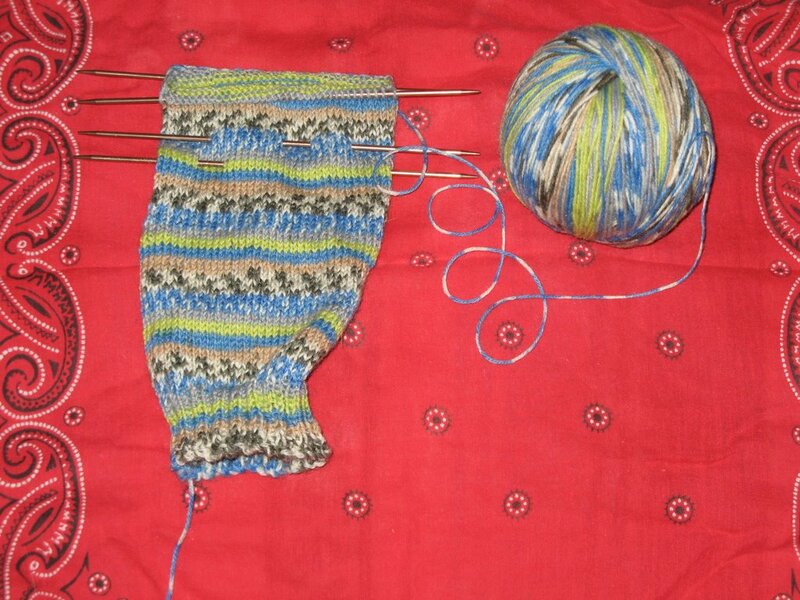 Mum (British-bred) always knitted socks on four needles (3 + 1), and turned out Patonyle socks for my father at such a rate (and he a lanky 6 feet tall) that her socks actually outlasted her by 20 years. About ten years ago he mentioned that he was down to 3 well cared for pairs, kept exclusively for winter bush-walking and bird watching outings. So I knitted him 2 more pairs for Christmas that year. Did I mention that these were all KNEE length? Gae in Callala Bay - in what we laughingly call winter !! So sad old abilities fade away, knitting socks..., I hear your message. I know zero about darning but I am interested in a pair of socks, house socks. I am size ten , how much? Y'all maintain an art just as I do as a craftsman, furniture and glass, keep it up! Thanks for the info on the "Don't Tread On Me" flag....I see this flag on a porch in my neighborhood and had no idea what it stood for! Our neighbor is surrounded by progressives and I guess he's making his statement to the neighborhood. I'm glad several people liked this post. It's a bit of history that I truly love and I even managed to stay on topic with knitting history. To Goat: Thankfully, knitting is an "old ability" which is not fading away and which is becoming quite popular again amongst young folk. I suspect that a subconscious and deep need to to something tangible and NON-electronic is at the root of this trend. I don't usually take consignment work, but I will email you off-blog about this. To saz: The Gadsden flag seems to be a flag of strange bedfellows. I have seen it flown by history buffs like myself, and also by people on both extremes of the political spectrum who feel that the Stars and Stripes has been co-opted in one way or another. I have always loved the Gadsden flag because I think that, regardless of our individual politics, it is very important to remember our deepest roots, and that patriotism is not the sole property of jingoistic folks who chant "USA! USA! USA!" during times of war, as though they are cheering at a football game. I am always wryly amused at folks who think they are being profoundly patriotic when they fly those little plastic American flags that clip on your car windows, as college-team flags do. And while they feel patriotic in their hearts, that is a most imroper way to display the Stars and Stripes, and it actually violates flag protocol in several ways .... improper display on a motor vehicle, leaving it out un-illuminated at night and in all sorts of bad weather, etc..... and what amuses me most about this is that although I am politically moderate, I tend to lean a bit left of center, and it is certain of my very conservative friends, not I, who are doing all sorts of unintended irreverence to the flag in their manner of display. Thankfully, everyone here respects each other and can find both history and humor in this!!! Thanks very much for the information on Ben Franklin and rattlesnakes. The Gadsden flag is one of my LiveJournal icons.